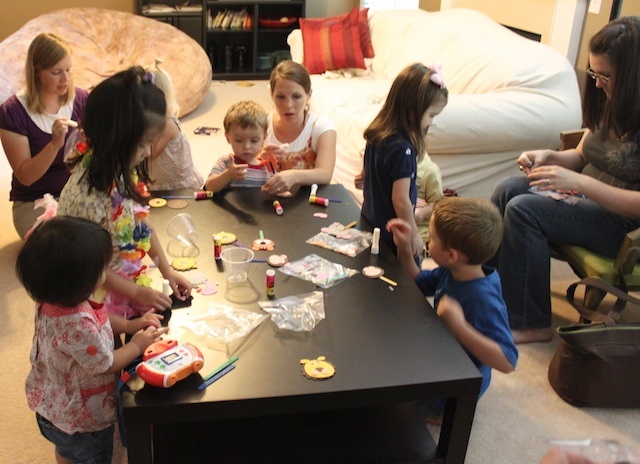 When the kids arrived, I had a little animal puppet craft for them to make on popsicle sticks. And of course the kids smothered themselves with toys in the playroom. Then lunch. 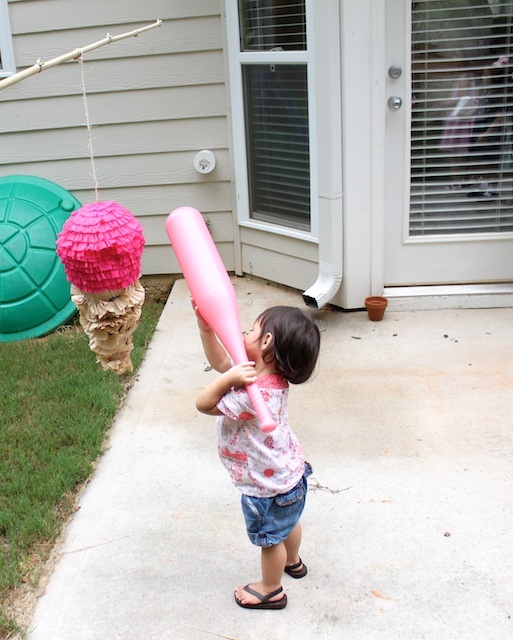 After lunch the kids went outside to hit the piñata. Once all the candy was cleared from ground, everyone came back in to escape the heat and for the gift opening. 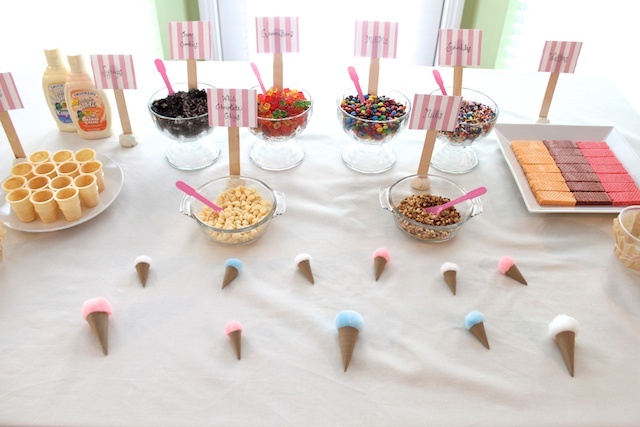 While Kaye opened gifts, I worked on setting up the ice cream bar. 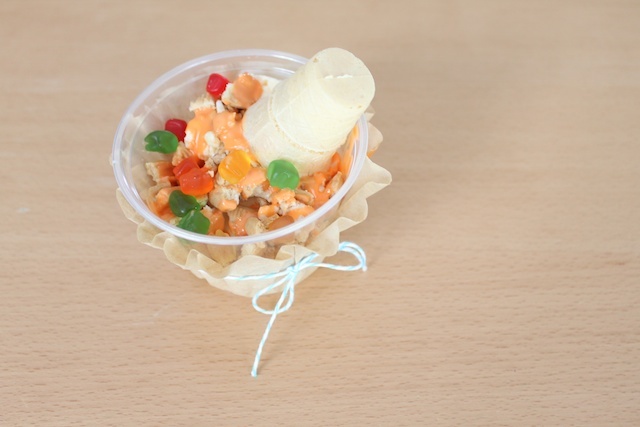 The toppings were mini ice cream cones, syrups, Oreo cookies, baby gummi bears, mini M&Ms, sprinkles, waffers, white chocolate chips and chopped nuts. I made special signs for each topping using calligraphy and embossing. Then I taped them onto large popsicle sticks. Finally I made it stand by sticking the bottom end of the popsicle stick into white playdough. 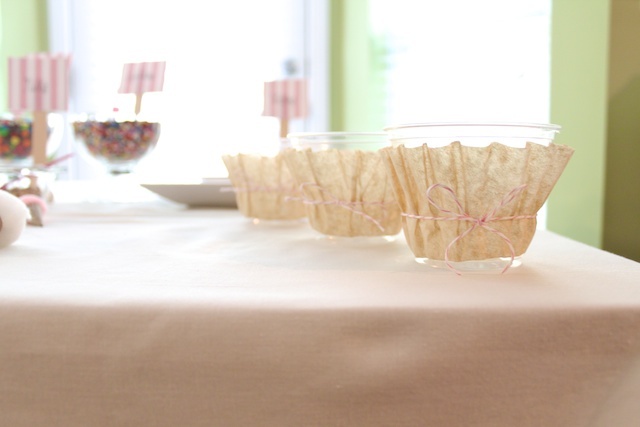 I also decorated the ice cream bowls by using clear plastic cups and covering it with coffee filter that had the bottom of the filter cut out. Next I used double-sided tape to keep the filter attached to the cup. Then used bakers twine to add a hint of color. 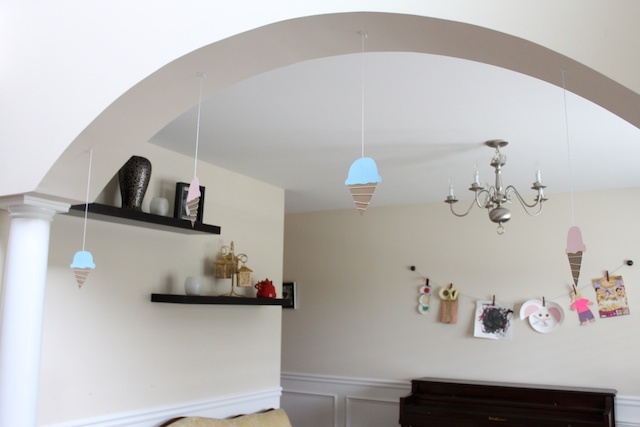 I also made some extra ice cream invitations without the birthday info and glued them back-to-back to make some ice cream hanging for decorations. Lastly, the cake. 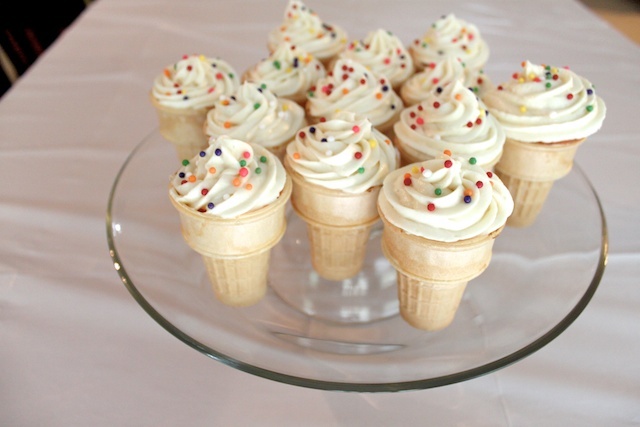 I made cupcakes in ice cream cones. 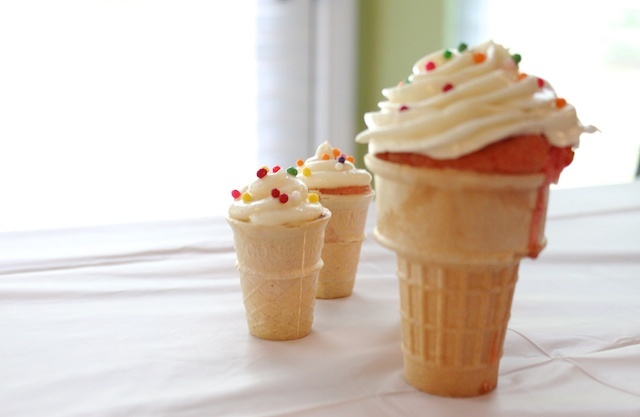 I make them in mini cones for the children and regular sized cones for the adults. The trick with these is to not fill them up too much. The cake will overflow the cones and make it mushy. » Tell me… I want to know what kind of cake you have made for your child. Do you make your own or do you get the store bought? Do you make two cakes so they can mess one up then serve the second cake? These party posts have been so great Tiffany! You really outdid yourself… what a beautiful party! Sorry I haven’t emailed you back yet!!!! We’ll talk soon. Do you use ichat? 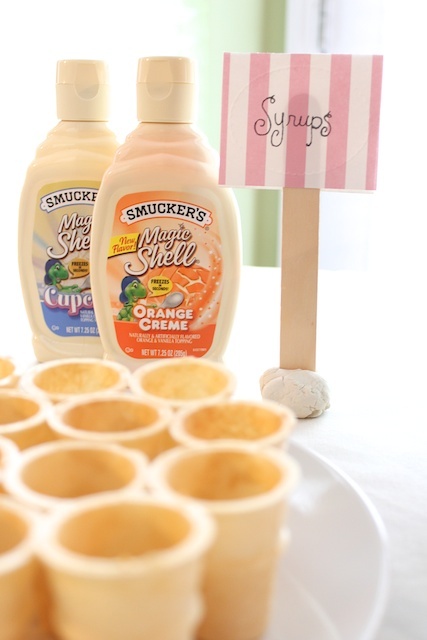 This is such a sweet party (no pun intended!) Thanks for sharing! 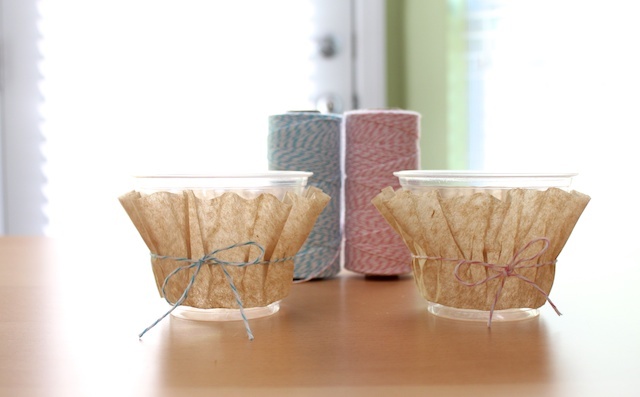 love the coffee filters around the cups – too cute!!! Wow! That is so cute! My little guy is almost one and I’ve been thinking about what to do for his 1st bday. 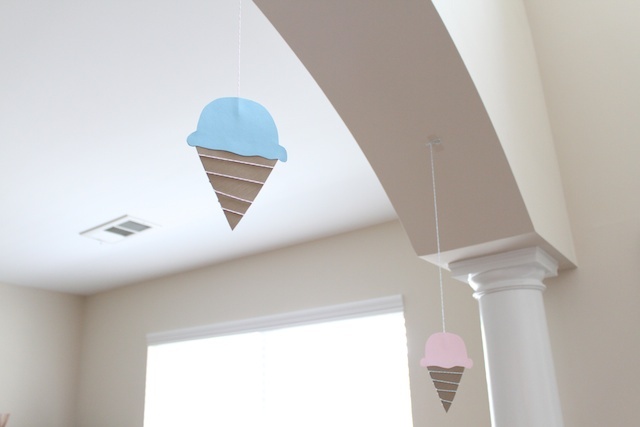 I don’t think I’ll have his little friends over until his 2nd birthday, but this is such a cute idea! i love how simple it is and yet super cute and fun. (so my style) well done, mama! i bet your little one had a blast! the cones for the cupcakes were store bought. the ones in the small cones are kid size cones. you will want to fill them up about half way with cupcake batter rather than 3/4 of the way because it will overflow and make your cone soggy. then stand the cones up in cupcake tin with batter in it and bake it for the amount of time of cupcakes. allow to cool completely before frosting it. the frosting i made cream cheese frosting because it’s white. i used the largest star cake decorating tip for the large cones and a smaller round tip for the smaller cones. let me know if you have any other questions. I have been searching for something different for my daughters 3rd birthday coming up in December and this looks perfect!!!!!!!!!!! Hopefully her daycare will allow me to come in and set this up. What are the tiny ice cream cones made from? I noticed them hanging with your banner and also on the toppings table…. They are so cute.